China's New Fishing Regulations: An Act of State Piracy? 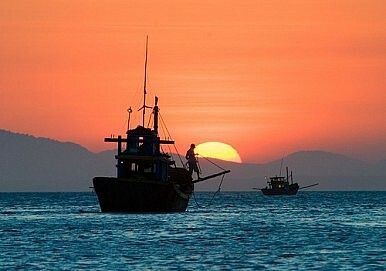 Hainan provinces new rules about fishing complicate China’s relationship with ASEAN. On November 29, 2013, six days after China’s Ministry of National Defense announced the establishment of an Air Defense Identification Zone (ADIZ) over the East China Sea, Hainan province quietly issued new regulations on fishing in the South China Sea. These regulations were announced on December 3 and came into force on January 1, 2014. Both of these actions were unilateral and aimed at extending the legal basis for China’s claim to land features and maritime zones in the East and South China Seas. China’s actions challenge the sovereignty of neighboring states, and have the potential to raise tensions and risk triggering an armed incident. Hainan province’s new fishing regulations require all foreign vessels that seek to fish or conduct surveys in waters claimed by China to obtain advance approval from the “relevant and responsible department” under the Cabinet. Hainan province claims administrative responsibility over Hainan Island, the Xisha (Paracel) archipelago, Zhongsha (Macclesfield Bank) archipelago, the Nansha (Spratly) archipelago “and their dependent waters.” These dependent waters stretch approximately two million square kilometers or roughly 57 percent of the 3.6 million square kilometers enclosed in China’s nine-dash line claim over the South China Sea. Foreign fishing boats and survey vessels that refuse to comply will be either forced out of the area or boarded, impounded and subject to a fine of up to $83,000. Hainan province authorities also assert the right to confiscate the fish catches it finds on the boats that it seizes. China has sovereign jurisdiction over the waters and seabed included in its Exclusive Economic Zone (EEZ). Hainan provincial authorities are within their legal rights to set restrictions on foreign vessels that seek to fish in this 200 nautical miles. But Hainan authorities must respect the innocent passage of all other vessels. China also asserts sovereign jurisdiction of the waters adjacent to the Paracel Islands. This claim is disputed by Vietnam. Both China and Vietnam, as signatories to the United Nations Convention on the Law of the Sea (UNCLOS), are obliged to refrain from taking unilateral action and are further obliged to cooperate and refrain from the threat or use of force. These obligations have been honored in the breach in the past. Hainan province’s new regulations also cover the waters in the area where China’s nine-dash line claim overlaps with the EEZs proclaimed by the Philippines and Vietnam. Any attempt to enforce Chinese jurisdiction in these waters will likely provoke resistance and could lead to armed clashes at sea. The most contentious aspect of the new fishing regulation, however, relates to what are commonly viewed as international waters. All fishing vessels and survey ships have a right of freedom of navigation in international waters. Any Chinese attempt to interfere with these vessels could be viewed as an act of “state piracy.” This could well entail international legal action against the Chinese ships involved. It is highly unlikely that China can enforce this new edict in the vast waters claimed by Hainan province. Despite the continuing build-up of maritime enforcement capabilities, including merging several agencies into a new Coast Guard, China lacks sufficient maritime patrol aircraft and naval vessels to consistently cover this vast area. This raises the possibility that China may selectively apply these regulations against Filipino fishermen. This would serve to add pressure on Manila and raise the costs of its political defiance against China over their territorial dispute. The new Hainan province fishing regulations also have the potential to undermine the diplomatic work put in by Chinese and Vietnamese officials to manage their territorial dispute. Last October during Premier Li Keqiang’s visit to Hanoi, both sides agreed to set up a hot line between their ministries of agriculture to deal promptly with fishing incidents. They also agreed to set up a working group on maritime cooperation. Although there continue to be isolated incidents involving Chinese state vessels and Vietnamese fishing boats, the number of incidents reported publicly as of last year appears to have declined sharply. The new fishing regulations raise the prospect of reversing this trend. The second question is what impact the fallout from this latest development will have on forthcoming consultations between China and ASEAN on a Code of Conduct in the South China Sea. In the past some members of ASEAN privately disassociated themselves from the Philippines’ public criticism of China. If ASEAN cannot reach consensus on how to respond to China’s new assertiveness in the South China Sea, this will play into Beijing’s hands. Aerial defense and surface-to-air systems are increasingly a focus for the People's Liberation Army.